The British Gazette » Brexit: Pulling the communication cord! I also remember the Bramhope Tunnel which is on the Harrogate Line between Horsforth station and the Arthington Viaduct. The line connects between Leeds and York via Knaresborough and Harrogate. Happily, it is still operating. Bramhope Tunnel is just over two miles in length and as a little boy I found it quite exciting. No doubt some Europhile psychologist will start suggesting that your Editor has all sorts of potentially dangerous psychiatric conditions following this revelation! One of the abiding memories and something I still automatically notice, is the presence of the communications cord now known as the emergency stop cord. Another thing that I notice is the increased cost of the penalty. It is now £50. However, this increase is deceptive, for the penalty has actually decreased substantially. 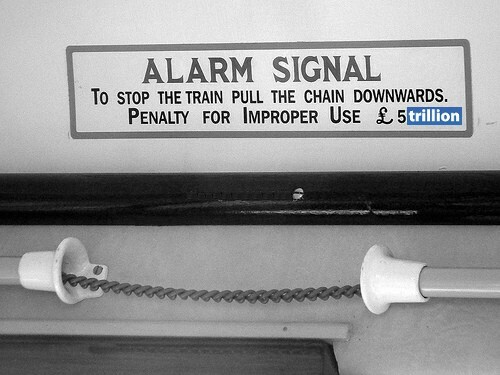 You see, when I was on that trip to Whitby the penalty was as in the image above – before it was “Photoshopped” – £5. In 1964, £5 was worth a lot more than £50 in 2017. Of course, we all know the reason for that: INFLATION. A modest measure of inflation is actually something economists do not worry about. What they worry about is something called “hyper-inflation”. A famous historical example of course is that which occurred in the Wiemar Republic in the 1920s. 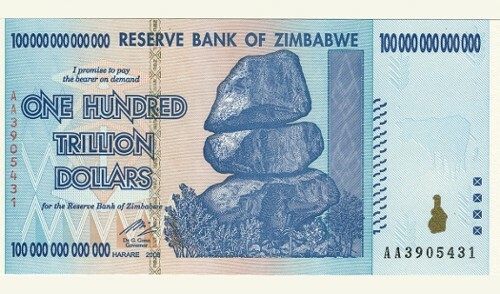 A much more recent example is the case of the former Southern Rhodesia which became Zimbabwe and under the despotic rule of “Butcher Bob” the currency collapsed as is spectacularly demonstrated by the banknote below! Today, Dr. North once again applies his expert analysis to the seeming train-crash in progress that is the current Brexit process. 1. How many apart from Dr. North and Mr Booker appreciate the scale of the consequences? 2 (a). Who are these people and (b) are they in positions of authority or influence? 3. Will they do anything to stop it? 4. Now of course, the proper thing to do is to place country BEFORE party. However, were one to place party [UKIP] before country, what would be the best course of action? Well, whilst your Editor cannot answer questions # 1 to #3, he can provide an answer to #4. That would be to pull the communication cord and stop Brexit. AKA revoke Article 50. Simples! Were the Europhiles to do this – using the necessary procedure of a second referendum they will effectively have “saved UKIP’s bacon” as UKIP will after this be able to say, “We was robbed!” and that the negotiations were sabotaged in order to force a second referendum and force the British People to vote to keep this country as a suzerain state of the European Union! Of course, in saying – sorry, shouting – this they would be correct! You see, as this organ pointed out repeatedly during the referendum campaign and since, that there was, is and will be only ONE way to “Brexit”. And that is to “Flexcit”! That, ladies and gentlemen is a FACT. There is NO other practical way! You may not like it, but there it is. There are lots of things in life we don’t like. For instance, I do not like the FACT that my dowsing pendulum when used near an ancient site such as a stone circle, cannot provide me with the upcoming winning numbers of the lottery! This is a very great annoyance for the ability to acquire millions for no effort is something I desire! But there it is. The pendulum does not work!